Rowdy was a good old dog. The Westfall-Yee family pet for over fifteen years, Rowdy ran like the wind, chased but never caught birds and squirrels and prairie dogs. He must have had some herd dog in him, because he would stand protectively between his people when the doorbell rang or a stranger approached. You could bury your face in his white ruff and feel better. His ever-wagging tail ensured that no matter what, someone was glad to see you. Last week we had to put Rowdy down. It was the right thing to do, and everyone knew it. He was sick and hurting; his little fur body worn out. The vet was the soul of kindness. The procedure was gentle and mercifully swift. But there were tears, and the house is intolerably quiet. I was not prepared for the flood of sympathetic responses to my Facebook announcement of his death. Over one hundred fifty at last count. The usual, family and close friends and local people who knew sweet Rowdy. But also acquaintances I know just slightly, people who never met him. People who never react to my posts about attending a Rockies game or marching against gun violence. And almost all of them said some version of this: Sorry for your loss. They are truly members of our family. There are some experiences, some feelings that unite us across any other differences. Almost everyone understands the significance of a beloved pet’s death, and are quick to reach out with condolences. Admitting vulnerability in this instance generates loving support, not criticism or ridicule. Humble mud of the earth, pottery was molded and then baked in ovens or in the blazing desert sun. Sometimes the potter painted or glazed the finished product. 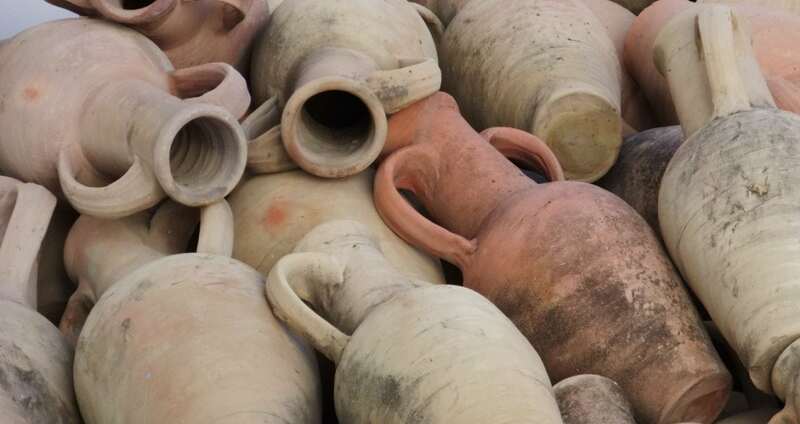 Clay jars were the repository of valuable documents, including the Dead Sea scrolls and they lasted millennia. Clay jars also had an ordinary purpose as the “every day dishes” used to eat and drink from; to collect the precious, infrequent rainfall; and hold the oil used for lamplight. They were large and small; decorated and plain; but the one thing they had in common was they were all breakable. We have this treasure in clay jars … Was the apostle thinking of the creation story and the description of how God made humans from the dust of the earth, and then breathed living Spirit into them? From our very origins, the people God created have reflected both infinite glory and utter fragility. We are breakable from the first breath we take until we draw our last one. It is an essential part of being human. Yet we possess a treasure; we are a treasure, stamped with the indelible image of God; endowed with god-like powers to reason, to create, to experience awe, to choose, to laugh and cry, to love. Paul writes frankly about these twin realities of the human condition, not apologetically, but to remind the Church that our vulnerability provides a direct connection to the source of life. The light, the extraordinary power belongs to God, and does come not from us. But there’s the rub. Vulnerability too often feels like weakness; like exposing our soft underbelly for the advantage of our opponent. As Woody Allen noted, “Maybe the lion will lie down with the lamb, but the lamb isn’t getting much sleep.” We hear it in the language of business and diplomacy. Never let ’em see you sweat. Make them beg for consideration. We say it ourselves, as a sign of our independence and strength. No, no I’m fine. I don’t need any help. In the back of our minds, we imagine that power comes from invulnerability. Or at least the appearance of it. I suspect that behind our outward protestations lies a whole lot of fear that we’ll be discovered for the quaking bowl of jello we actually are. The apostle Paul has never been known for his modesty or self-deprecation. Yet in this text, he seems to let down his guard and be candid about his afflictions, perplexities, and struggles. We have no way of knowing how the Corinthians responded, but based on my experience of church, I’m betting they greeted him with open arms, brought him a meal, and put him on the prayer list. Acknowledging our vulnerability opens a pathway to strength. It may remind us of the spiritual power available to us in ways we may forget if we barrel our way through life with bluff confidence. It bonds us with other people, because every single one of us knows what it is like to feel scared, uncomfortable, and out of our depth. I wonder how this perspective could affect our lives as families, neighbors, church. What if we risked a real answer to the greeting “How’s it going?” instead of the standard “Fine” (which someone has pointed out is probably the most frequent lie we ever tell)? Can we replace forced joviality with honest feeling? What if our conversation was peppered with invitations to “say more about that,” and questions that probed below the superficial? Could we practice dropping the façade of self-reliance and seek the community’s assistance in rough times? Instead of bringing our metaphorical weapons to the table, what if we realized life isn’t a fight, a competition with others in which we are either ahead or behind, winning or losing? Could we lead with kindness instead? As we engage with issues and conditions that don’t yield to easy solutions, could we admit that we don’t know the truth, the whole truth, and nothing but the truth? So help us God! Make us more open to hearing other perspectives, and bring us to new places of understanding and appreciation. Friends, our breakable God yearns to receive the dead dogs, the open wounds, the regrets and pain from God’s people, and place in these dear and fragile clay jars the treasure that brings healing, wholeness, and life.